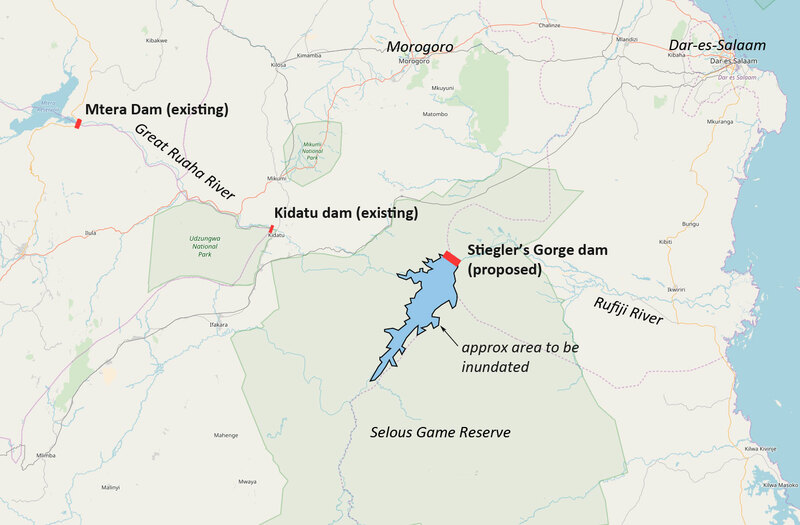 The government remain undeterred in its plans to construct a large dam in the Rufiji River, at Stiegler’s Gorge in the Selous Game Reserve, [see also TA 120] despite concerns expressed by conservationists and MPs. The Selous Game Reserve is one of the last major expanses of wilder­ness in Africa. It’s a protected UNESCO World Heritage Site the size of Switzerland. Since 2014, it has been on UNESCO’s List of World Heritage in Danger, primarily because of elephant poaching. In less than 40 years, the park lost 90% of its elephants. However, the planned hydropower dam could have an even more devastating impact. At 130 meters (427 feet) in height and stretching 700 meters across the canyon, the dam will create a lake of 1,500 square kilometres and will generate up to 2,100 MW of power. The dam would also have a significant impact on livelihoods further downstream. A WWF report found the dam would trap most of an estimated 16 million tons of sediment and nutrients carried by the river every year, leading to soil erosion and cutting off lakes and farmland downstream. The Rufiji delta, home to fish, shrimp and prawn fisher­ies, as well as the largest mangrove forest in East Africa, would also be starved of water. In all, the construction of the dam could damage the livelihoods of over 200,000 farmers and fishermen, according to the WWF. The IUCN said that the project is ‘fatally flawed’ because of its ecologi­cal impact. It called on Tanzania to ‘permanently abandon’ it. The Director-General of UNESCO, Audrey Azoulay, wrote a letter in January expressing her concern about the irreversible damage the pro­ject could have on the Selous. 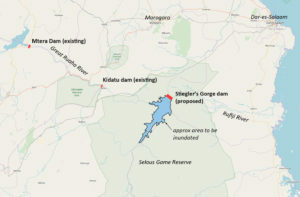 The World Heritage Committee (WHC) of UNESCO, which lists the Selous as a World Heritage Site, expressed its “utmost concern,” saying the dam project has a “high likelihood of [causing] serious and irreversible damage.” The WHC added the Stiegler’s Gorge project as a new factor that endangers the Selous eco­system. The government rejects this criticism. When WWF published its report in 2017, tourism minister Jumanne Maghembe insisted the hydropower was needed to transform Tanzania’s economy. The government is pushing ahead to fell more than 2.6 million trees from the area that would be flooded by the dam. Now Tanzania has taken its defence of the project to UNESCO. At the 42nd meeting of the World Heritage Committee, held in June in Bahrain, Tanzania cited sustainable development to push for the project. Major General (rtd) Gaudence Milanzi, Permanent Secretary in the Ministry of Natural Resources and Tourism, said Tanzania has main­tained its position to continue with the project as stated during a meet­ing of the committee in Poland last year. He explained that the dam was primed to play a critical role in the vision of the government to industrialise the economy. MPs have also questioned the order of developments, asking why the decision to fell so many trees had been taken before the EIA had been completed. “I wonder why the government wants to move on with the project and yet we know well there will be an impact, especially due to felling of trees. Let us get the EIA n the project,” said Peter Msigwa (Chadema, Iringa Urban). Similar points were made by Zitto Kabwe (ACT Wazalendo, Kigoma Urban) and Nape Nnauye (CCM, Mtama). The Deputy Minister in the Vice President’s Office for Union Affairs and the Environment, Mr Kangi Lugola, told parliament the government would go on with implementation of the project “whether you like it or not.” He added that “those who are resisting the project will be jailed.” Mr Lugola has since been promoted to Home Affairs Minister.